The only things I have left to do are to buy a couple of baskets for the opened snack bags and pastas, organize the cookbooks so they don’t take up half a shelf and make a wooden box with casters for my cookie sheets, cooling racks, large trays and cutting boards which live in the box on the floor for now. Know anyone with a table saw willing to make a 1/2 inch plywood box with casters 18 inches wide by 18 inches long by 17 inches high? 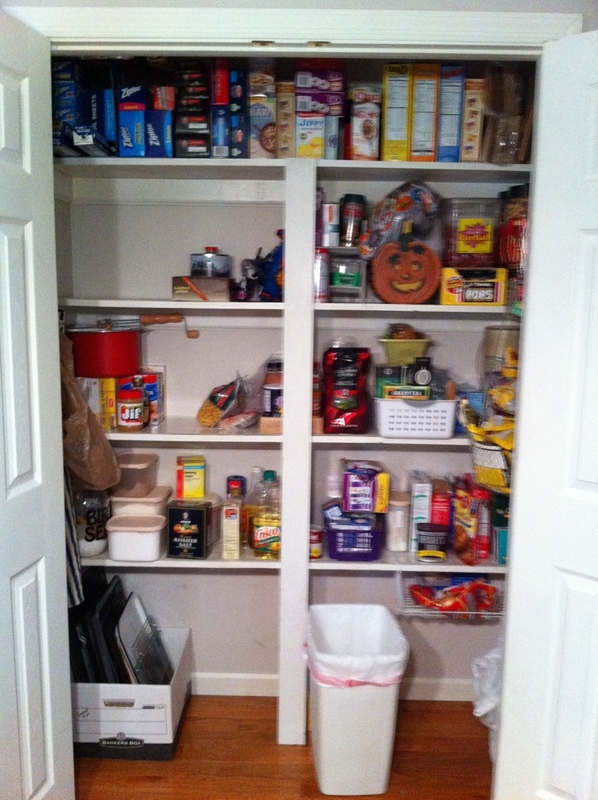 ALL my extra food used to be stored in the basement but I decided to bring the boxed goods upstairs into the kitchen. We do have a dehumidifier but I still worry about dampness getting into the dry goods. The canned goods are still down there. Going to the basement for something is part of my exercise program. 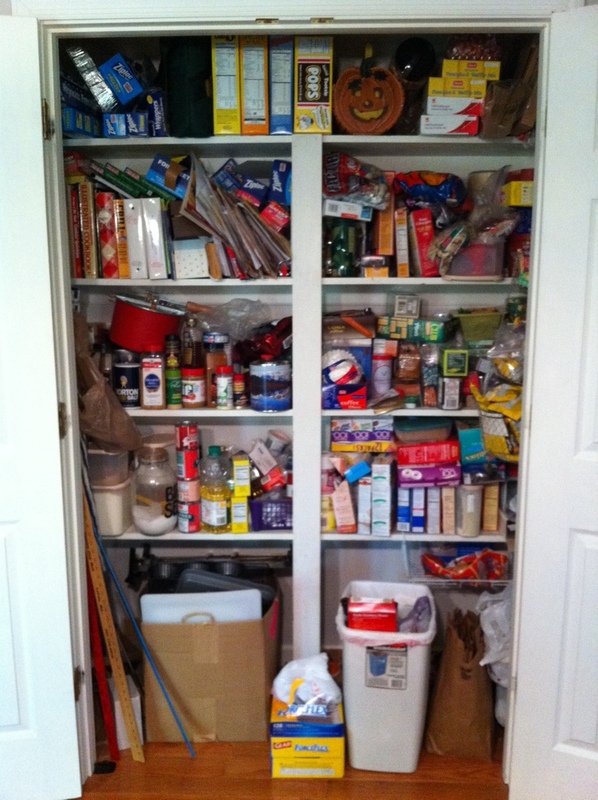 Expired foods, things that didn’t belong in any pantry, and stuff I don’t remember buying went into the garbage. The setup isn’t ideal as the shelves aren’t adjustable so I have to work with what I’ve got. Once I get the crown molding installed, the rooms repainted and the craft room finished, I’ll think about redoing the pantry with adjustable shelving. It’s all about priorities. Time allotted for this project was two hours. Actual time from start to almost finished (this stage) was…four hours. Deciding how to put it all back took the most time. I found a 1,327 pound griddle that came with a gas grill we bought in 2003. Maybe we’ll remember we have it and actually use it. For what? I don’t know. Not sure why I had over 200 brown paper lunch bags either. This entry was posted in cleaning, declutter, knitting, organizing and tagged cleaning, declutter, organizing by Patti_is_knittinginflashes. Bookmark the permalink. You and Mr. Aitch can take another ride down here. You can help me organize my world and he can help the Big D build your box. It might take a month to organize my world, but at least you’d be here and not at work, right? You have 200 lunch bags for your before-Christmas gifts!